What is optimal knowledge working? Chefs all know they work in the food service industry, but managers don’t all know they work in the knowledge industry. How can office workers perfect skills that are so loosely defined they don’t have a collective term? Does knowing how to use Microsoft Word make someone a good manager? And if all chefs can chop efficiently, why can’t all office workers type efficiently? Knowledge working is the core business of every office worker who performs non-routine problem solving. We direct and manage and strategise and, through our knowledge, we find ways to improve processes and performance across all industries. Nakedize specialises in educating knowledge workers so they can improve their own performance. For example, we help policy advisors to write compelling papers, we help scientists to write compelling funding applications, and we help chief executives to write compelling strategy papers and to establish plain language initiatives that improve the writing of everyone in their organisations. 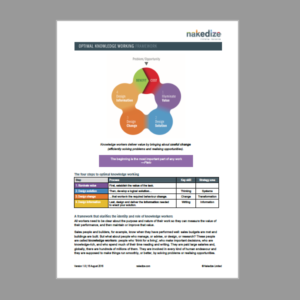 Download the free Nakedize Optimal Knowledge Working framework one-page PDF. Register for our Introduction to Optimal Knowledge Working course. 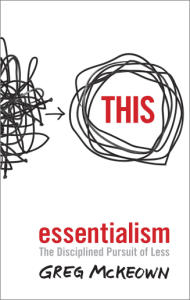 In late 2018, Nakedize Essential Education is publishing An Introduction to Optimal Knowledge Working — essential reading for every knowledge worker.